Soy or coconut milk is a delicious non-dairy alternative, which can be enjoyed in any drink at Starbucks, offering vegans more choice and flavour combinations. Add a splash of coconut milk to your filter coffee or Americano for a dairy-free morning perk, or ask for soy milk in a Mocha Frappuccino. Cold Brew is the latest in cold coffee innovation and is vegan-friendly. The smooth tasting coffee can be served black or with soy or coconut milk.. Cold Brew is made through a unique brewing method with cold water that is steeped for over 20 hours, combining the best of roasting and brewing high quality beverages, as well as showcasing the passion our baristas have for coffee. 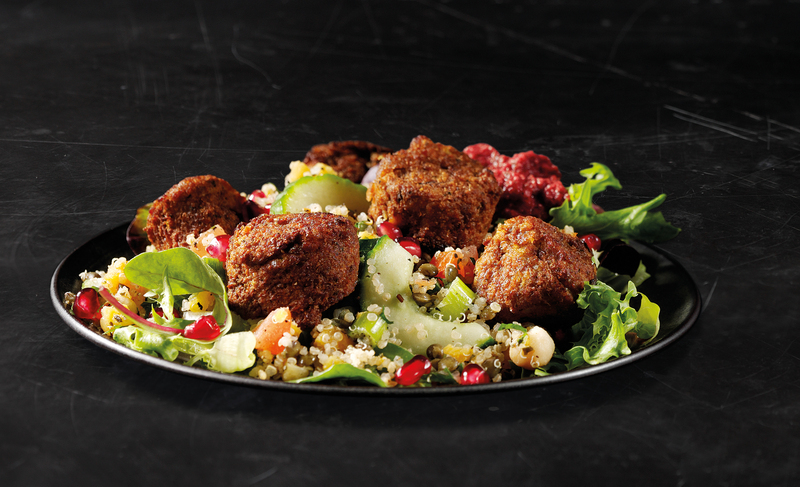 A deliciously fresh vegan salad, the sweet potato falafel combined with pomegranate kernels and wholesome quinoa makes for a truly satisfying lunch. The new Teavana range is handcrafted by Starbucks baristas using high quality teas and botanicals, offering customers a variety of unique flavour combinations including Iced Black Tea, Iced Green Tea and Iced Hibiscus Tea – a refreshing iced drink perfect for warm summer days. Recharge with a refreshing, handcrafted Cool Lime Refresha from Starbucks. A zingy blend of citrus flavours with hints of mint and cucumber, and shaken with slices of fresh lime – this is a delicious, lower-calorie pick-me-up that’s dairy free.